A narrative on the extensive martial curriculum and wisdom of the Tenshinsho-den Katori Shinto-ryu, one of the source traditions of Japanese swordsmanship, from its incumbent master teacher. Encompasses an introduction to the history, technical curriculum including kenjutsu (swordsmanship), iaijutsu (sword drawing), naginatajutsu (halberd), and shurikenjutsu (throwing spikes), and esoteric / strategic curriculum including hōijutsu (directional divination) and chikujōjutsu (fortifications) of the Katori Shintō-ryū, based on references to its scrolls. 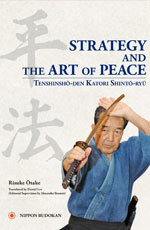 Additionally includes the author’s reflections on nearly seventy years of austere training, and illuminates the “art of peace”, the philosophical foundation required of all practitioners.